Home > Telephone > What's Happening With 0845 and 0870 Numbers? National rate and local rate numbers must have seemed like a good idea to BT when they introduced them in 1996. Known in the trade as 'non-geographical' numbers, i.e. they can be diverted to any number and aren't fixed to any particular location, they offered companies a way of making it cheaper and easier for customers and suppliers to call them. In those days BT still held by far the majority share of the telephony business in the UK and the numbers were a simple proposition. In the days when calls were metered by the distance you were calling, a local rate call using an 0845 prefix (originally 0345 and called 'Lo-call') meant that you could call a business and not bother about where it was, as the cost would be the same as calling someone next door. National rate numbers were a different proposition. They weren't any cheaper than dialling a number that was a long way away from your home, but it made it fairer because everyone would be charged the same regardless of where they lived. As non-geographical numbers are transferred within the telephone system to real numbers, that real number could actually be anywhere from Land's End to John O'Groats. This means that if a business moves, or transfers a department to another location, the 0870 number (originally 0990) can stay the same. This is cheaper for companies as they don’t have to spend time and effort informing other companies about the change. As customers are able to dial the same number as before there is less loss of business. Unfortunately for 0845 and 0870 numbers the landscape of the telephony business has changed significantly in the last two decades. Two major changes have affected non-geographical numbers, the emergence of all-inclusive payment plans and the decision to start allowing companies with 0845 and 0870 numbers to start sharing the revenue from the calls made to them. Most inclusive call plans do not include 0845 and 0870 numbers so suddenly the 0845 calls, rather than being cheaper than national rate calls, started to become more expensive, because other calls would be included in the flat-rate paid by the customer. The problem increased because many of the new telephone companies springing found that they could charge anything for an 0845 or 0870 number, within reason. Mobile operators in particular are notorious for not publishing their rates for these numbers. All of this generated a lot of resentment with consumer groups complaining and quite a few websites springing up which publish 'real' numbers instead of the 0870 numbers that companies advertise. This was exacerbated when people began to find out about the revenue sharing agreements that many companies had entered into. Other telephone companies would obtain the non-geographic numbers from BT and then do deals, usually with large companies with a lot of call volumes, to share some of the revenue that they received each time a customer called one of these numbers. This increased the resentment towards dialling these numbers particularly as call centres became more distributed. One of the other advantages of non-geographic numbers is that calls can be sent to a different call centre depending on demand, but also they could be queued. This increased suspicion that companies were less likely to put more staff on the phone lines if they were earning money through customers paying while they queued. The telephone regulator in the UK, Ofcom, eventually announced that from February 2008 they would no longer allow revenue sharing deals on 0870 numbers. Ofcom also announced that new national rate numbers using an 03 prefix would be launched that again would not have any revenue sharing element. In addition, 03 numbers can be included in call packages, but check before you start using them. In 2009 BT announced that they would be changing their all inclusive call plans to include 0845 and 0870 numbers, a move that signified a shift in attitude and one that many people hoped would be copied by other companies. It turned out that the move was partly to take attention away from plans to increase line rental fees. It remains to be seen how the market will develop as currently there are no plans to change the rules with regard to 0845 numbers. There is also confusion with other numbers that have variable rates such as 0871 and 0844 numbers, although they are currently capped at a maximum of 10p per minute and 5p respectively. If you feel that you would prefer not to use these numbers the best thing to do is find other numbers to call instead. One way of finding them is to search on the Internet for some of the sites that publish alternative numbers. Another is to look through the literature or the websites of companies, trying to find numbers that they publish for customers living abroad. 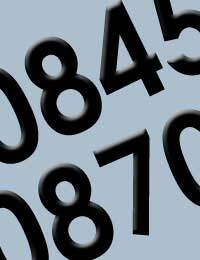 As most non-geographic numbers can't be used from abroad companies have to publish real numbers for those customers to dial. Look for numbers which begin with +44 or 0044 and dial those, removing the 44 and anything in front of it and putting a '0' in front. National rate and local rate numbers were introduced in the 1980s on 0345, 0541, 0645 and 0990, then converted to 0845 and 0870 in 1996......... ""There is also confusion with other numbers that have variable rates such as 0871 and 0844 numbers, although they are currently capped at a maximum of 10p per minute and 5p respectively."" -- Those caps apply only to BT prices. The price paid depends on the first six digits of the phone number. The price is set by the terminating telecoms company. BT are regulated to not make profit on these numbers, so all of the money paid for the call is passed on to the terminating telecoms company to share with the called party as revenue share. Other networks add to the call price, hence these numbers costing up to 15p/min from non-BT landlines and up to 45p/min from mobiles. The originating phone company pays the same amount to the terminating phone company as BT would pay the terminating phone company for the same call. From 2014 this fee will be known as the Service Charge and every user of an 084 or 087 number will be required to declare it wherever their number is advertised.